The Tutu Project uses unique landscape photos to raise money for patients with breast cancer. Bob Carey was standing on a grassy median in the middle of the Long Island Expressway, surrounded by traffic and wearing nothing but a pink tutu. A commercial photographer and for decades his own subject, the 58-year-old was using a tiny remote control to shoot pictures of himself, knowing full well that he was trespassing. Looking on was a producer from NBC’s “The Today Show,” who was interviewing Bob about his plans to publish a book of self-portraits — all featuring him in a tutu — to lift the spirits of patients with breast cancer. Not unexpectedly, the police showed up. Since then, that adventure has landed the photographer and his wife, Linda Carey, at the helm of a nonprofit organization that uses humorous but artistically shot tutu images to raise money for people with breast cancer. Helping those patients is important to the couple because Linda is one of them: She has metastatic, HER2-positive disease. The effort is also meaningful to Bob because his mother died of breast cancer. BOB and LINDA CAREY, married since 1988, are the creators of, and driving force behind, the Tutu Project. Launched in 2012, the Carey Foundation and its Tutu Project initiative (thetutuproject.com) aims to help cover expenses that health insurance won’t: mortgage payments, food, child care, wigs and transportation to medical appointments. So far, the foundation has raised over $500,000. The organization doesn’t give the money directly to patients but donates it to larger advocacy groups for distribution. Corporate support from Bloomingdale’s, the private aviation company Jet Linx and others, as well as help from smaller businesses, helps keep the nonprofit afloat. 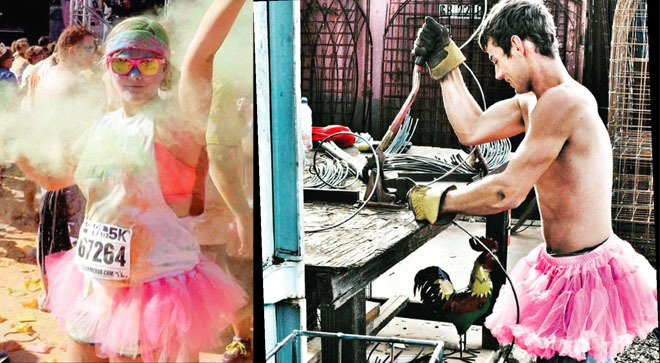 In addition, most years, the foundation raises money by selling a calendar featuring Bob’s tutu images. In 2015, the organization upped its efforts by starting its annual October #Dare2Tutu campaign, inviting people to share photos of themselves in tutus on social media and raise funds for donation. Jet Linx has contributed about 3,500 tutu images during the past four Octobers, and at least 50 other businesses and individuals have participated since the inception of Dare2Tutu, submitting hundreds of images. Finally, the foundation offers to mail Tutu Cheer Packages, each with a note from Linda. These efforts attract a lot of attention, and not just from police officers. Reporters from all over the world have inter­viewed the couple, and organizations including American Ballet Theatre and Ringling Bros. and Barnum & Bailey Circus have invited Bob to shoot photos with their casts. In the meantime, he continues to work as a commercial photogra­pher, with Linda serving as his producer and co-editor. The Careys met in 1986, married in 1988 and opened a photo studio in Arizona, where they lived at the time, in 1989. That was the year Bob’s mother died. Four years later, he found himself more deeply grieving her death. “I started photographing myself as a form of self-therapy,” he recalls. “That project went on for nine years.” It gathered a following, with exhibits of the work shown in museums. Bob started shooting photos of himself in the tutu again eight months later, after the couple had moved to Brooklyn, New York, from Tempe, Arizona. The move was an enormous change for them, but before they’d had even a year to adjust, they sustained another shock — Linda’s cancer diagnosis. After getting the news, Bob continued to express himself through self-portraits. He shot a lot of the photos during visits to Arizona, during time between commercial assign­ments, moving away from the dark, emotional imagery of the previous decade and toward more color and landscape. In the most recent Tutu Project calendar, his tutu-clad form appears on location in the Fort Worth Water Gardens in Texas, Loveland Pass in Colorado, Central Park in New York City and Moraine Lake in Alberta — and, of course, perched atop the slippery, wet railing around the Canadian side of Niagara Falls. “It was always about transforming myself, and especially after moving to New York, it was about being vulnerable, because being vulnerable is always kind of the best way to break out of your fears,” Bob says. “It was like being in New York with 8 million people, but I felt all alone. I tried to find big, expansive, epic areas to photograph myself (in), but I was alone in this huge area, so it was about the melancholy and the loneliness in this huge space that I wasn’t used to. Linda was glad that her husband was continuing the photo series, believing it was a healthy outlet. “I learned early on that caregivers are usually pushed aside, because it’s about the person that was diagnosed, and I recognized that Bob’s art was a way for him to just settle into what was going on,” she says. But she also found the photos uplifting as she went through chemotherapy. In them, she saw humor, vulner­ability and maybe even fear — emotions to which she could relate. Plus, she thought the images were simply fun. 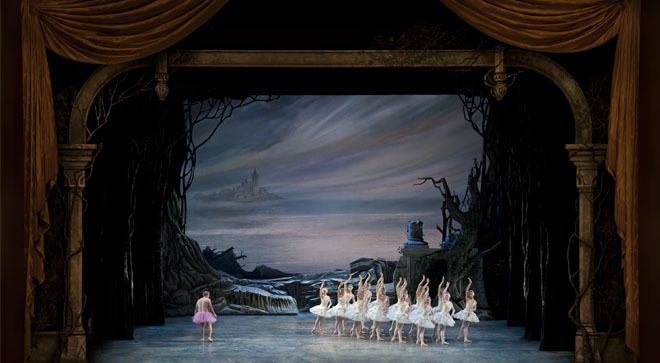 BOB CAREY poses with members of American Ballet Theatre. The couple called their effort the Tutu Project and pitched it to numerous publishers. All but one “weren’t interested in a guy in a tutu,” Linda says. One company offered a deal but rescinded due to an economic downturn, Bob adds. Over the next six years, he kept networking, speaking to classes at the International Center of Photography in New York City, showing his photos to the students and describing his goal. After one class, a man approached him to express enthusiasm about the project, noting that his own wife had experienced breast cancer. It was the producer from “The Today Show,” who offered to air a piece about the work when a project was ready to launch. But first the Careys needed to figure out how to raise $80,000 to publish 5,000 books. Linda found the solution when she sent out a mission statement to 1,300 supporters via email, offering a limited-edition book, each with a small print in the front pocket and accompanied by a 20-by-24-inch limited-edition print, for $500 apiece. The email blast led to an article in the Daily News and a mention on Yahoo’s homepage. Nearly immediately, the Tutu Project’s Facebook fan page jumped from 450 likes into the thou­sands, its email account flooded with responses and its website crashed. Bob called the producer, who arranged a seven-minute, on-air interview with “The Today Show” co-host Matt Lauer. Aid has also come from a former photography student of Bob’s, Marcela Shine, the organization’s only staff member besides the Careys, who helps with social media and business development and serves on the board. In addition, Jet Linx has supported the Carey Foundation for four years. “Every year I’m able, they fly me out to one of their 14 bases to make an image with one of their jets,” Bob says. Linda hopes her efforts through the foundation and in the metastatic breast cancer community are not just helping patients financially but also raising awareness and offering hope. In photos submitted as part of the #Dare2Tutu campaign, a woman, left, participates in a race and, right, a mechanic raises funds with fellow employees of Auto and Tire Doctor in Truckee, California. Over the last three years, the company has raised $20,000 for the Tutu Project.